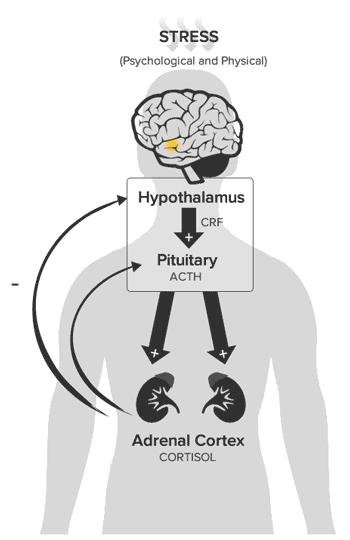 The hypothalamic pituitary adrenal (HPA) axis is our central stress response system. The HPA axis is an eloquent and every-dynamic intertwining of the central nervous system and endocrine system. This system works in a fairly straight-forward manner. The HPA axis is responsible for the neuroendocrine adaptation component of the stress response. This response is characterized by hypothalamic release of corticotropin-releasing factor (CRF). CRF is also known as CRH or corticotropin-releasing hormone. When CRF binds to CRF receptors on the anterior pituitary gland, adrenocorticotropic hormone (ACTH) is released. ACTH binds to receptors on the adrenal cortex and stimulates adrenal release of cortisol. In response to stressors, cortisol will be released for several hours after encountering the stressor. At a certain blood concentration of cortisol this protection is ostensibly achieved and the cortisol exerts negative feedback to the hypothalamic release of CRF and the pituitary release of ACTH (negative feedback). At this point, systemic homeostasis returns. With repeated exposure to stressors, the organism habituates to the stressor with repeated and sustained HPA axis activation. Therefore, it is important to support healthy cortisol levels in order to ensure the hypothalamus and pituitary glands maintain the appropriate level of sensitivity to the negative feedback of cortisol. Secretion of alarm chemicals such as epinephrine and norepinephrine from the adrenal medulla, as well as HPA axis activation persists along with the secretion of CRF, ACTH, and cortisol. Interestingly, with aging, the hypothalamus and pituitary are less sensitive to negative feedback from cortisol and both ACTH and cortisol levels rise as we age.1 Older women secrete more cortisol in response to stress than do older men. Young women, however, produce lower levels of cortisol in response to stress than do young men. Under conditions of normal exposure to cortisol, our tissues only experience fleeting glimpses of the alarm catecholamines and cortisol. As we are addressing the various health consequences of stress, it is imperative to also address the axis of response itself. Restoring homeostasis to the HPA axis is the primary goal of integrative care.